The ratio of CEO pay to that of ordinary workers has exploded over the last four decades, going from less than 30-to-1 in the 1970s to more than 200-to-1 by 2000 and in most subsequent years (Mishel and Schieder 2017). There is an ongoing debate about the causes of this increase in CEO compensation. Many economists have argued that this increase in CEO pay is justified by the returns to shareholders produced by successful CEOs (Mankiw 2013; Kaplan 2012a; Kaplan 2012b; Hubbard and Palia 1995). On the other side, critics of increased CEO pay see it as a breakdown in the corporate governance structure that allows CEOs and other top executives to enrich themselves at the expense of shareholders (Bivens and Mishel 2013; Bebchuk and Fried 2004; Bertrand and Mullainathan 2001). These critics point to compensation packages that allow CEOs to profit from events beyond their control, such as a general rise in the stock market or an increase in world oil prices driving up profits and stock prices for oil companies. One mechanism that has been proposed for containing CEO pay is to limit its tax deductibility. In the early 1990s, CEO pay in excess of $1 million was no longer an allowed deduction for the purposes of corporate income taxes. However, an exemption was made for “performance-based pay”—stock options and performance-based bonuses, for example. This type of pay could be fully deducted in any amount. The recently passed Tax Cuts and Jobs Act (TCJA) ends this performance-based pay deduction. This paper assesses the likely effect of this change on the trajectory of CEO pay by exploiting the fact that a provision of the Affordable Care Act (ACA), passed in 2010, prevents health insurers from deducting CEO pay in excess of $500,000.1 This part of the ACA, which went into effect in 2013, meant that CEO pay in excess of $500,000 would still be treated as taxable profits for insurers. This change effectively raised the cost of CEO pay, in excess of the $500,000 cap, to the company by more than 50 percent. If CEO pay were fully deductible for a company paying the 35 percent marginal tax rate that was in effect until 2018, a dollar of pay would cost the company only 65 cents in after-tax profits. With the cap in place, a dollar of pay in excess of the $500,000 cap would cost the company a full dollar in after-tax profits. If we assume that CEO pay reflects the marginal product of the CEO to the company (the boost to the company’s profit that is directly attributable to the CEO), the higher after-tax cost to insurers should mean that their pay will fall. If their marginal product has not changed, then an insurer would have to reduce CEO pay to keep the after-tax cost of the compensation package in line with their marginal product. There is no evidence that limiting the deductibility of CEO pay for health insurers lowered this pay relative to other industries, after controlling for other determinants of pay. The failure of reduced deductibility to slow growth in CEO pay in the health insurance sector relative to other sectors means that the TCJA provisions are unlikely to significantly affect CEO pay more widely. The assertion that rapid growth in CEO pay in recent decades has simply reflected shareholders rationally rewarding excellent performance by executives is flawed. It can hardly be rational for shareholders to ignore tax changes that make CEOs significantly more expensive to them. Instead, shareholders’ failure to respond to the increasing expense of CEO pay strongly supports the view that weaknesses in corporate governance have failed to discipline the growth of CEO pay. To restrain growth in CEO pay we need reforms to improve corporate governance and give shareholders more power over corporate executives. While the number of CEOs of major companies is inherently limited, their pay can have an outsized impact on inequality in the economy. Most immediately, CEO pay has an impact on the pay structure for other top executives as well. If CEOs were still being paid 20 to 30 times as much as ordinary workers, the pay of the top executive at the largest companies would be in a range of $1–$2 million. In this situation, their top assistants would likely be looking at pay in the high hundreds of thousands or perhaps just over $1 million. By contrast, in a context in which the CEO at a major corporation can draw pay in excess of $20 million, the other top executives can expect annual compensation that runs into the millions of dollars. In the largest companies, especially in the financial sector, there can be dozens of high-level employees with pay of more than $1 million a year (Bakija, Cole, and Heim 2012). In addition to the direct effect of CEO pay on inequality, there is also an indirect effect. The high pay for top executives in the corporate sector affects pay in hospitals, universities, other nonprofits, and the government. The pay of top executives in nonprofits has also risen sharply over the last four decades, at least in part because they could legitimately point to much higher pay for CEOs at comparably sized organizations in the corporate sector. In the nonprofit sector as well, high pay for university presidents or CEOs has the effect of raising pay for other high-level positions. And, as a matter of simple logic, more pay at the top means less pay for everyone else. In this context, it makes a big difference whether the rise in CEO pay reflects their greater value to the corporation than was the case four decades ago, or whether it is the result of a failed corporate governance structure. If the former is the case, then whatever inequality results from the increase in CEO pay is a result of a changed market structure. In other words, higher CEO pay is the result of technology, globalization, and other changes in the economy over the last four decades. By contrast, if the rise in CEO pay is the result of a failure of the corporate governance structure, then we can look to find ways to change power relations within the corporation to rein in CEO pay. In this situation, reducing CEO pay would not have an economic cost, since their pay was not closely related to their marginal product. In principle, shareholders should support policy or rule changes that reduce CEO pay, since that would increase corporate profit. Capping the deductibility of CEO pay can be seen as one mechanism for reining in pay. By making CEO pay in excess of the cap more expensive for corporations, it should lead to a reduction in pay. In this case, the shareholders don’t necessarily benefit from lower pay, since the reduction in pay would be largely offset by a higher tax burden. However, lower CEO pay would directly have an impact on inequality by reducing the pay of a substantial segment of very high earners. In addition, there should be a secondary effect from reducing CEO pay. Insofar as CEO pay provides a benchmark for other top executives at corporations and for top executives in the nonprofit sector, a reduction in CEO pay should put some downward pressure on the pay of other high earners as well. 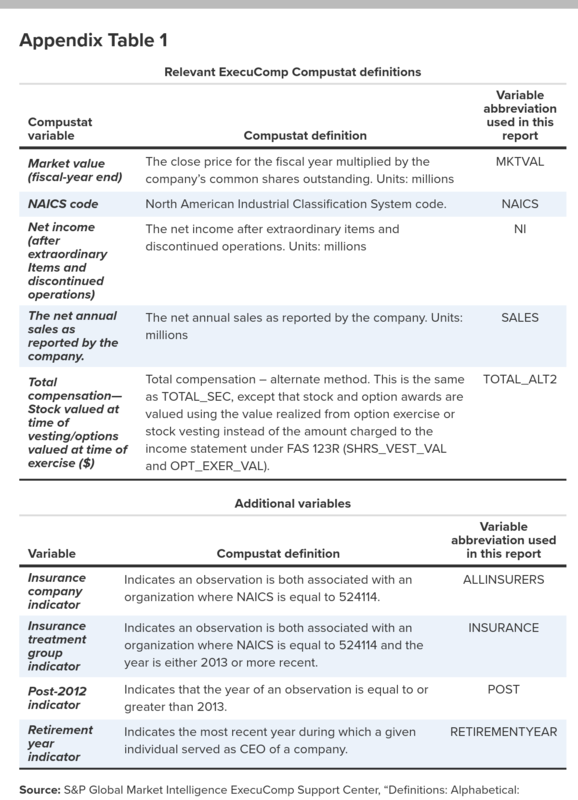 To test the impact of the cap on deductibility we used the Compustat dataset (see appendix), which contains information on the pay of CEOs, the value of incentives such as stock options and bonuses, and a wide range of other company specific data, such as sales, profits, and market capitalization. We are interested in seeing if there is a measurable change in CEO pay for insurers in the years from 2013 to 2016 when the cap on deductibility was in effect. Our sample size for insurers is limited since there are, on average, 9.5 insurers in the sample for these four years. Nonetheless, if the cap has a strong effect on pay, we should be able to find some evidence. We initially used a sample that takes data from the years 2002 to 2016 for all the firms in the database. After realizing that the insurers were considerably larger than the average firm in the database, we restricted the sample to companies that had sales equal to more than $8 billion in 2017 dollars. Table 1 shows summary statistics for this narrow sample that provides the basis for the tests discussed in this paper.2 Figure A shows the average compensation for the insurance companies in the sample and the overall average in the years since 1992. Notes: CEO compensation reflects salary, bonuses, the value of amounts earned during the year pursuant to nonequity incentive plans, changes in pension value and nonqualified deferred compensation earnings, options exercised, the value of restricted shares that vested during the year, and other compensation. Compensation values reflect Compustat's TOTAL_ALT2 series. All values are in 2017 dollars. Notes: All values are in 2017 dollars. Compensation values reflect Compustat's TOTAL_ALT2 series. Source: Authors' analysis of Compustat's ExecuComp database. The dependent variable we used in our tests is the Total Alt-2 measure of CEO compensation shown in Column 3 (average CEO compensation across firms in sample). This takes the contracted pay and benefits and the estimated ex-ante value of all bonuses and options granted in the year specified.3 (The variables are defined in full in the appendix.) Column 2 shows the number of companies in the sample in each year. Column 4 shows average net income or profit of the companies in the sample. Column 5 shows average sales or revenue. Column 6 shows the average market capitalization of the firms at the end of the year. The bottom half of the table provides the same information for the insurers in the sample. Table 2 shows the results of regressions using various lag lengths as well as those that interacted the performance variables with the insurance industry variables. Column 1 presents a baseline specification containing dummy variables for years, a firm’s classification as being in the health insurance industry, and the treatment group. The regression in Column 2 has the level of CEO pay as the dependent variable, with the performance variables included at both levels and also year-over-year differences. While most of the coefficients of the performance variables are insignificant, the coefficients for both the level of the change in income and the change in sales are highly significant. Given the high degree of correlation between the performance variables, it is not surprising that the coefficients for all of them would not be significant. Notes: * p<.05; ** p<.01; *** p<.001. Model 1 provides a baseline for comparison and only includes dummy variables to designate the treatment group, all health insurers, and years. Model 2 does not include interactions or lags. Model 3 does not include interactions, and all variables are lagged by one year. Model 4 does not include interactions, and all variables are lagged by two years. Model 5 includes industry-specific interactions, but no lags. Model 6 includes industry-specific interactions, and all variables are lagged by one year. Model 7 includes industry-specific interactions, as well as a retirement dummy. Model 8 includes industry-specific interactions, as well as retirement and year dummies. Column 3 shows the results from a regression using the same variables but with a lag of one year. In this regression, the coefficient for the change in net sales is positive and significant at the 1 percent level. We found similar results for a regression run with two lags, shown in Column 4. Here, the coefficient for the dummy variable for insurers in years after 2012 is insignificant but positive. Column 5 shows results for the same regression as seen in Column 1, except that the performance variables are interacted with the industry variables. This would be appropriate if the impact of profit, sales, and market capitalization on CEO pay in the insurance industry were different than in other industries. In this regression, the coefficients for the interacted levels of the performance variables are all highly significant. The difference in sales is positive but only significant at the 5 percent level; the difference in net income is also significant at the 5 percent level but negative. The coefficient for the dummy variable for insurers in the years after 2012 is, again, positive, but not close to being significant. Column 6 shows results for same regression as seen in Column 2, except that it uses interacted performance variables. In this case, the coefficient of the lagged income and sales variables are positive and highly significant. The lagged difference in the sales variable is also significant. The coefficient of the lagged interacted profit variable is negative. Here again, the coefficient for the dummy variable for insurers in the years after 2012 is positive but not close to being significant. The last two columns in Table 2 show the results from two additional regressions. Column 7 is structured the same way as Column 4, with interacted performance variables. However, this regression also includes a dummy variable for the retirement year of a CEO, as well as a lagged dummy variable indicating there is a new CEO. The coefficient for the lagged dummy variable indicating a new CEO turns out to be negative and highly significant, indicating that new CEOs typically have a pay penalty. The coefficients on the performance variables are mixed, with the coefficient for the profit variable being positive and highly significant. But the coefficients of the sales and market valuation were negative and highly significant. Here again, the coefficient for the dummy variable for insurers in years after 2012 is positive but not close to being statistically significant. Column 8 shows the same regression as Column 1, but it includes year dummies. In this regression, the coefficient for the lagged retirement variable is, again, negative and highly significant. As with the regression in Column 1, multiple of the coefficients of the performance variables are negative and significant. Only the coefficients for the profit variable and the change in sales are positive and significant. The coefficient for the dummy variable for insurers in the years after 2012 is negative in this specification but nowhere close to being significant. We also experimented with regressions that used the compensation of the highest paid employee, rather than the CEO, as the dependent variable. The results were not qualitatively different. This was also the case when we experimented with longer lag structures. To sum up these findings, there clearly is no evidence that the cap on the deductibility of CEO pay for insurers in the years since 2012 has had an effect on reducing CEO pay. In almost all of our specifications, the coefficient on the dummy variable for insurers for the years in which the deductibility cap was in effect was positive, and in some specifications statistically significant, implying that CEO pay for insurers was somewhat higher than what would be predicted, based on the performance variables. The only specification in which we found a negative coefficient, although not close to being statistically significant, had highly significant negative coefficients for most of the performance variables. Since it is not plausible that higher revenue, profits, and market capitalization led to lower CEO pay, these specifications cannot be viewed seriously. The failure to find any evidence that the cap on deductibility had any impact on CEO pay is striking, but we do have to point out the limited size of this sample. We are focusing on a relatively small number of insurers in four years in which the market underwent a major expansion and transformation due to the ACA. It is certainly possible that the factors determining pay are more complicated than the variables we have included in our regressions. This means that we have to interpret our finding of no effect with considerable caution. However, it is nonetheless worth assessing the implication, if, in fact, caps on deductibility do not affect CEO pay. The failure of deductibility caps to lower CEO pay is consistent with the alternative explanation of CEO pay: that it primarily reflects a broken corporate governance system in which CEO pay has little connection to performance. From this perspective, the higher cost of CEO pay is something that the directors are willing to simply pass on to shareholders in the form of reduced profits. They are more concerned with staying on good terms with their CEOs than with maximizing returns to shareholders. In addition to what the failure of the cap on deductibility to reduce CEO pay may tell us about the nature of the market for CEOs, it also indicates that capping the salary deduction is not likely to be an effective route for reducing CEO pay. The TCJA of 2017 included a cap on the deductibility of CEO pay in excess of $500,000 for all corporations, not just health insurance companies. Our analysis suggests that this broader cap is likely to have little effect in reducing CEO pay. If our analysis correctly measures the impact of capping deductibility on pay, then it will be necessary to use other mechanisms to actually rein in CEO pay, most likely, changing the rules of corporate governance.5 While altering the rules of corporate governance may seem more complicated than just changing the tax code, it could prove to be easier politically. If CEO pay does not reflect CEO value to the company, then excessive pay is coming at the expense of the shareholders. Shareholders should have a direct interest in changes in corporate governance that would make it easier for them to limit the pay of CEOs and other top corporate executives. The policy of limiting the deductibility of even performance-based pay for CEOs has much to make it worthy of recommendation. Evidence strongly indicates that performance-based pay is not an efficiency enhancing institution that should be given preferential treatment in the tax code, so ending this preferential treatment is the rare provision in the TCJA that seems to make some economic sense. Further, ending the performance-based pay deductibility will raise a modest amount of revenue to roughly $9 billion per year (Balsam 2012). However, this analysis finds little evidence that ending the deductibility of performance-based pay will significantly affect the trajectory of CEO pay. 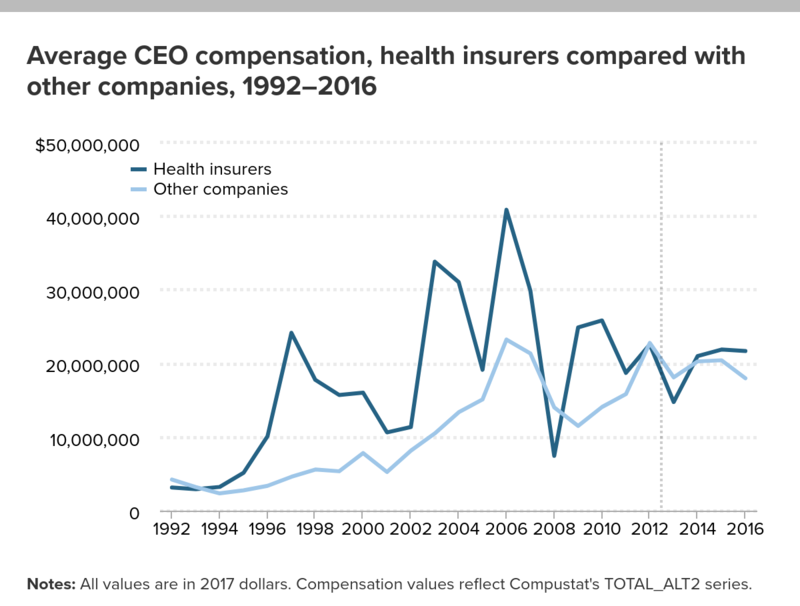 We find no evidence that the provision of the ACA limiting the deductibility of CEO pay for insurers had any effect in reducing CEO compensation. This would tend to support the view that CEO pay is determined much more by the power of CEOs in corporate decision-making than the returns they generate for shareholders since the change in tax treatment unambiguously raised the cost of CEO pay to the companies that employ them. This also suggests that efforts to rein in CEO pay by limiting deductibility more generally, as was done in the Tax Cut and Jobs Act of 2017, will not be effective. In order to limit CEO pay it may be necessary to alter the rules of corporate governance in ways that increase the power of shareholders over the CEO. This assessment must be qualified by the fact that our sample included a relatively small number of firms over a span of just four years. Jessica Schieder (jschieder@epi.org) joined the Economic Policy Institute in 2015 as a research assistant. She assists EPI’s researchers in their ongoing analyses of the labor force, labor standards, and other aspects of the economy. Schieder aids in the design and execution of research projects in areas such as income inequality, the gender wage gap, and immigration. She also works with the Economic Analysis and Research Network (EARN) to provide research support to various state advocacy organizations. Schieder has previously worked for the Center for Effective Government (formerly OMB Watch) and the U.S. Senate. She has a bachelor’s degree in international political economy from Georgetown University. Dean Baker (baker@cepr.net) is senior economist at the Center for Economic and Policy Research, a Washington, D.C.-based organization that he co-founded in 1999. He is frequently cited in economics reporting in major media outlets, including the New York Times, Washington Post, CNN, CNBC, and National Public Radio. He has written several books. His most recent, Rigged: How Globalization and the Rules of the Modern Economy Were Structured to Make the Rich Richer, shows the upward redistribution in income in the U.S. was the result of conscious policies that were designed to put downward pressure on the wages of ordinary workers while protecting and enhancing the incomes of those at the top. He formerly was an assistant professor of economics at Bucknell University. He received his bachelor’s degree from Swarthmore College and his doctorate in economics from the University of Michigan. The net annual sales as reported by the company. Source: S&P Global Market Intelligence ExecuComp Support Center, “Definitions: Alphabetical: Execucomp Definitions Listed Alphabetically,” 2017. 1. President Clinton’s first budget included a provision that prohibited corporations from deducting more than $1 million of CEO pay from their profits, unless the pay was performance related. The main effect of this provision was to shift CEO pay into the form of bonuses and grants of stocks and options, all of which were still fully deductible as performance-related pay. 2. We ran a number of regressions with the full sample. The results were not qualitatively different than the results from the more restricted sample. These results are available from the authors on request. 3. The estimated value of options and bonuses is taken directly from Compustat. It uses the Black–Scholes method for estimating values. 4. The failure of CEO pay to decline with the loss of deductibility could be reconciled with a conventional view of CEOs getting paid their marginal product, if the supply of CEOs were nearly perfectly elastic. This would mean that companies would be forced to pay the going wage for a CEO and would have little flexibility. This would leave them with no choice but to absorb the additional cost when they lose the ability to deduct most of the CEO’s pay. The view that the supply of CEOs as being highly elastic is inconsistent with other generally accepted facts about the market. First, it should mean that there is a lot of movement by CEOs across firms. A company offering just above the standard wage should be attracting CEOs, while one offering just below the standard wage would lose its CEO. Also, there should not be much variance in performance adjusted wages for CEOs since CEOs would leave the low-paying companies and jump to the high-paying companies. In fact, there is relatively little movement of CEOs between firms, and there are large differences in performance adjusted pay. 5. One possibility would be to attach a penalty for directors to the triannual nonbinding “Say on Pay” votes of shareholders on CEO pay packages. For example, if the directors lost their stipends when a pay package is voted down, they would have a large incentive to ensure that the pay package, given their CEO was not excessive. Bakija, Jon, Adam Cole, and Bradley Heim. 2012. Job and Income Growth of Top Earners and the Causes of Changing Income Inequality: Evidence from U.S. Tax Return Data. Department of Economics, Williams College Working Paper No. 2010-22. Balsam, Steven. 2012. Taxes and Executive Compensation. Economic Policy Institute Briefing Paper No. 344. Bebchuk, Lucian, and Jesse Fried. 2004. Pay without Performance: The Unfulfilled Promise of Executive Remuneration. Cambridge, Mass. : Harvard University Press. Bertrand, Marianne, and Sendhil Mullainathan. 2001. “Are CEOs Rewarded for Luck? The Ones Without Principles Are.” The Quarterly Journal of Economics, vol. 116, no. 3, 901–932. Bivens, Josh, and Lawrence Mishel. 2013. The Pay of Corporate Executives and Financial Professionals as Evidence of Rents in Top 1 Percent Incomes. Economic Policy Institute Working Paper No. 296. Hubbard, R. Glenn, and Darius Palia. 1995. “Executive Pay and Performance: Evidence from the U.S. Banking Industry.” Journal of Financial Economics, 105–130. Kaplan, Steven N. 2012a. “Executive Compensation and Corporate Governance in the U.S.: Perceptions, Facts, and Challenges.” Martin Feldstein Lecture. National Bureau of Economic Research, Washington, D.C., July 10. Kaplan, Steven N. 2012b. “Executive Compensation and Corporate Governance in the U.S.: Perceptions, Facts, and Challenges.” National Bureau of Economic Research Working Paper No. 18395. Mankiw, N. Gregory. 2013. “Defending the One Percent.” Journal of Economic Perspectives, vol. 27, no. 3. 21–34. Mishel, Lawrence, and Jessica Schieder. 2017. CEO Pay Remains High Relative to the Pay of Typical Workers and High-wage Earners. Economic Policy Institute.